Our local housing market sits primarily in the seller’s lap at the moment. Even so, you need to place a realistic price on your Havasu home. Otherwise, it could sit on the market for weeks without an offer. We tend to overprice our own Havasu homes because of their sentimental value. And who wouldn’t want to own your magnificent property, right? Where should you go to seek an honest opinion of your home before you list it? I’ve got a few ideas for you to consider. Your REALTOR® provides your first line of defense in a real estate transaction. 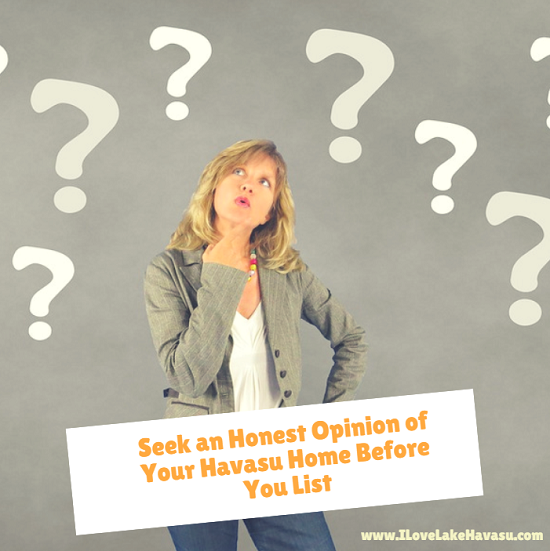 Ask them to honestly review how your Havasu home looks. How can you improve your home’s appeal? What current trends do they see that makes for a quick sale on the market today? What items should you include on your “honey-do” list before officially placing it up for sale? But the most important thing when soliciting your agent’s advice is to actually listen to what they say. They literally see dozens of homes currently on the market. It would be a shame to receive their input just to totally reject it. I always recommend staging your home to sell. And some staging can be done on your own. But it never hurts to seek a professional’s opinion. For just a couple hundred dollars, most professional stagers will come out to your Havasu home, make an assessment of where improvements could be made, and hand over a report stating their findings. This costs less than hiring a staging company to do it all for you. And you’ll receive very important style feedback that could help you get your home sold much more quickly. Never underestimate the power of visiting open houses. Look for open houses in your neighborhood. Talk to the agent in charge. Walk around to see how they staged the property. How does your home match up? This is what buyers will compare your house to when considering a purchase. You want to make sure your house is up to snuff with the competition. Finally, ask your friends and family for their opinions. Take photos of each room after you’ve staged it. Then, email, text or post those photos to just the people you know and trust on your social media. Most social media platforms allow you to make pictures only available to specific friends. Ask what they think of each room. Is the lighting good? Are there too many photos on the walls? Do shelves and countertops appear cluttered or crowded? What areas could use improvement and how? Use this information to make changes where necessary. The more people you talk to, the better.